This week in 1969, American astronaut Neil Armstrong made history by becoming the first person to set foot on the moon. His timeless and famous remark at the time, “That’s one small step for man, one giant leap for mankind,” will go down as one of the most iconic phrases of all time. Yet, when Armstrong visited Israel in 1994 he was brought to a place in the Old City of Jerusalem and asked Meir Ben-Dov, his host and noted archeologist, if Jesus himself actually would have walked there. Armstrong asked if these were the original steps, and Ben-Dov said that they were. “So Jesus stepped right here?” asked Armstrong. Indeed we know that for a Christian visiting Israel is a life-changing and faith building experience. 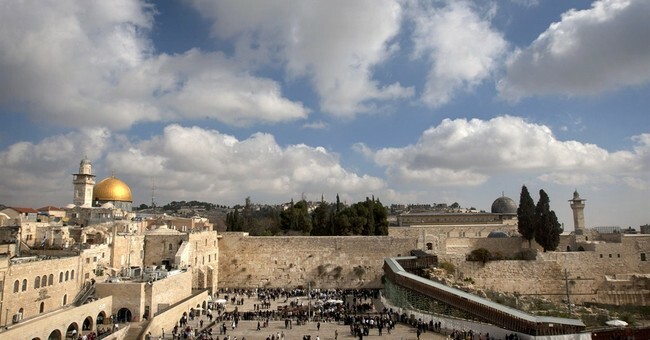 This is played out in numerous ways including visits to the Old City and specifically the Temple Mount where Jesus preached and worshipped along where he was crucified and buried, to the Jordan River where he was baptized, and of course the Galilee, and Nazareth, his hometown. As much as there are countless affirmations of Christians visiting Israel and having literally divine experiences, Neil Armstrong’s comments and frame of reference considering that he was the first man to step on the moon especially affirms this reality. But, ask any Christian who has been to Israel and at least nine out of 10 times you’ll hear a similar affirmation, and the desire to visit Israel again. And again. Run for Zion Was conceived in order to provide such an opportunity for Christians to have this same experience, albeit in a unique and boutique way. More than simply a tour of the Land, Run for Zion provides a series of meaningful and hands on experiences, one might even say a “foot on” experience. At its core, Run for Zion has the special privilege of promoting unique opportunities for Christians to run in Jerusalem, anywhere from a full to half marathon or 10 km. For non-runners wishing the same experience, there’s also the opportunity to walk through Jerusalem’s historic streets and experience the same things albeit slower. While it’s common for runners to listen to music to pass the time and motivate them along, in Jerusalem runners often run with no music, in order to not be distracted from the views and experiences. Running through the Old City itself is powerful, but one gets to run around the Old City and appreciate its view from the south, and from the east which is one that Jesus would have seen in approaching the holy city from the Mt. of Olives. Affirming that Jesus was a Jew in the Land and was very clear to reiterate God’s promise of Genesis 12:3, obligating his disciples to bless Israel, Run for Zion also provides meaningful and tangible opportunities for all participants to bless Israel and its people. Participants will have the opportunity to have friends and family sponsor their participation, the proceeds of which will go to a wide range of services that help millions of Israelis of all different backgrounds. And because God’s promise of Genesis 12:3 is a formula that is reciprocal, Run for Zion will also play an important role not just by being the beneficiary of the financial blessing, but in blessing those who bless Israel by providing significant subsidies to participants, reducing financial barriers that might prevent somebody from being able to travel to Israel, increasing the total number of people who are able to share this experience. Running through Jerusalem’s ancient streets will certainly be the anchor and main draw whether it be for athletes who run regularly, or for students to middle-age folk who may run or walk briskly a few times a week just for exercise. Maybe even some mall walkers will take the leap of faith and come to Jerusalem. However, more than the run itself, there will also be meaningful and interactive tourist experiences along with unique programs, worship, speakers, and an opportunity to interact directly with the people and programs that are the recipients of the financial blessing. If you’re a runner, walker, or aspire to be one and you’re a Christian and want to visit and experience Israel, Run for Zion may be for you and provides an easy way to participate. If your church, college or other group wants to bring a team to participate together, Run for Zion offers that seamlessly. If you’re neither but want to bless Israel and stand alongside Run for Zion in its ability to maximize the blessings for Israel and all participants, there is a special need. There are Christians living in Muslim countries for whom life is not easy and because many of the countries in which they live do not recognize Israel and its right to exist, much less that Jerusalem is its capital, for most, visiting Israel is only a fantasy. Run for Zion has been approached to help Christians in these countries participate and has taken on the responsibility to offer additional subsidies to such people, as well as to help secure visas which, on their own could not only be impossible, but even dangerous. Please visit RunforZion.com to find out details, inquire about participating, or making a donation so others can. And like Neil Armstrong, more than “one small step for man” let this be your one big leap for faith.